It seems that this chapter does indeed confirm my beliefs that I mentioned last time! Before you read the chapter, please make sure to check this out in case you haven’t, as it gathers all the information that foreshadowed the twist here. With that said, let’s start Chapter Secrets! First to read it!!!!! As usual Amazing work!!!! How do you bring up this much information in such a short period of time? Are you oda? Hola Artur. Gran trabajo como siempre. En tu caso no te has preguntado cómo es que Kaido estuvo presente en la muerte de Oden. 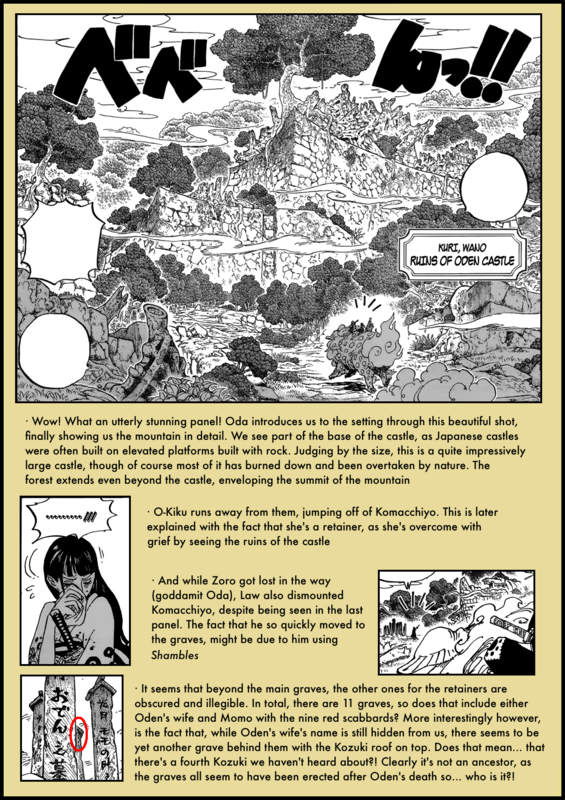 ¿Entonces desde cuándo Kaido está en Wano? ¿Desde cuándo Orochi y Kaido son aliados? 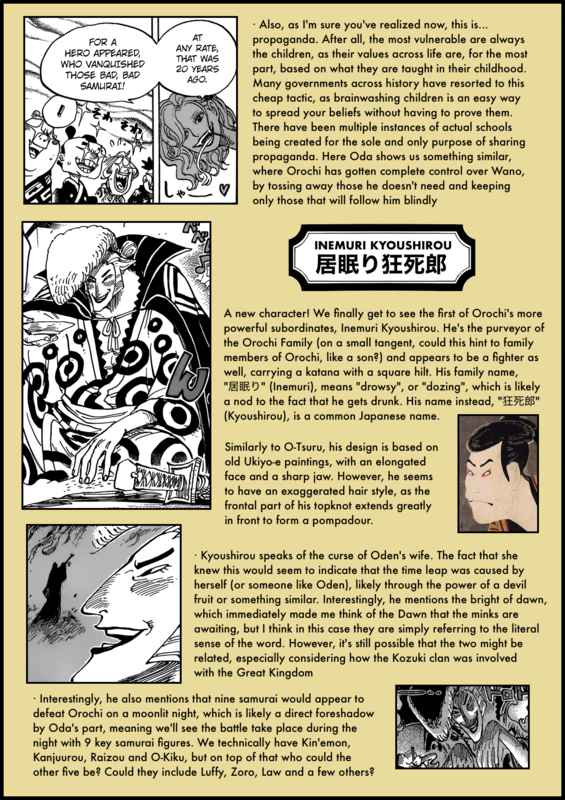 ¿Kaido y Orochi seran la misma persona? Pienso esto: hay una grand especulatión de que Kaido está implicado en los Rox hace 40 años. Entonces, el probabelmente teneria poder para conquistar Wano hace 20 años. Creo que esto tal vez tenga relacion con el convertir se en Yonkou. Pero no creo que seran la misma persona. 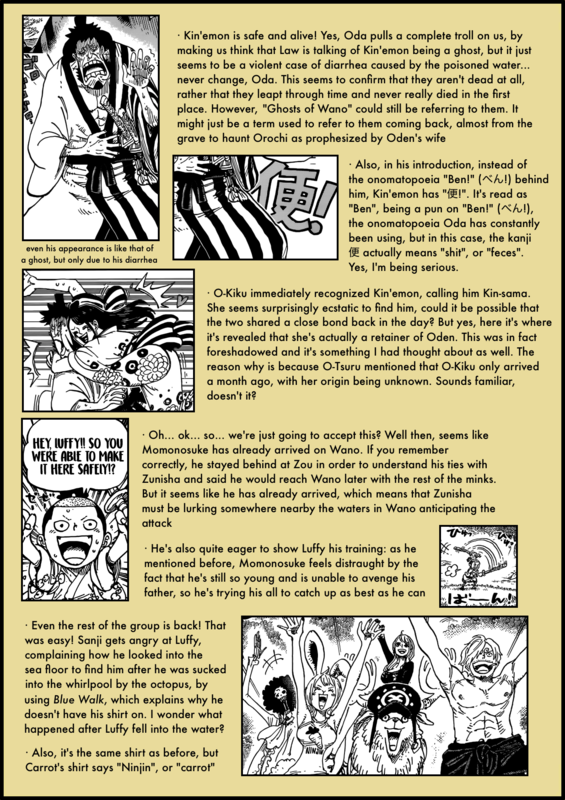 No me parece que es algo que Oda haría e los dos son mencionados muchas veces en Wano. 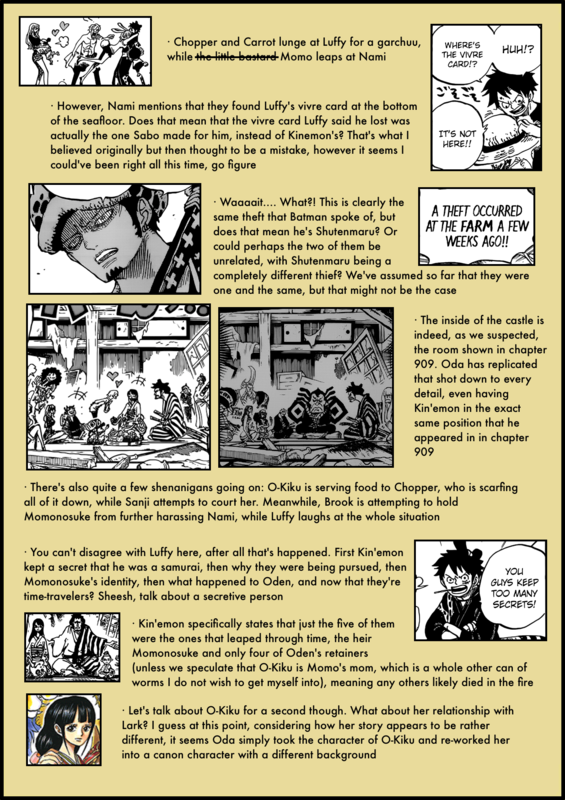 Maybe that’s the reason why Oda has Luffy carrying around that katana. So he can be considered one of the 9 samurai in the end (who, most likely, are all sword-wielders). Another potential candidate would be Hawkins. He’s got a sword as well and I don’t think he’s going to end up as fodder an Kaido’s side. I wouldn’t be surprised if he betrayed him and (temporarily) allied with Luffy, similar to Bege. So on a larger scale it wont be a kaidou arc as i suspected i guess? I always thought Moria would pop up from somewhere and give Luffy some shadows so he’ll be equal to Kaidou like he did back then to Ozd on TB arc. I thought the same about not being a Kaidou arc. I guess it will be Luffy v. Jack (maybe even Queen or King as a second and main fight), and Zoro v. Orochi, as he fights with a two swords style (maybe even Inemuri). The Moriah speculation can’t be discarded, though, as he mentioned he was defeated by Kaidou, I think Kaidou arc is the place for him to show (not necessary now, as we think it is not a Kaidou arc yet). But I think he will have a different role, not give shadows to Luffy. Nice work with the chapter and with the prediction. 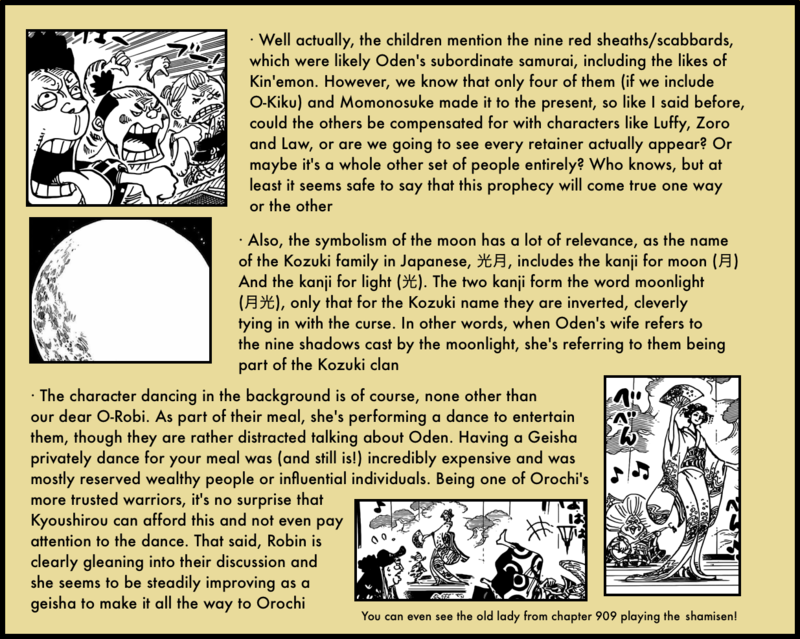 It’s nice that your speculations are consistent with the facts shown in One Piece, that is why you are usually right (except when Oda gives false hints, as on the destruction of Sunny). 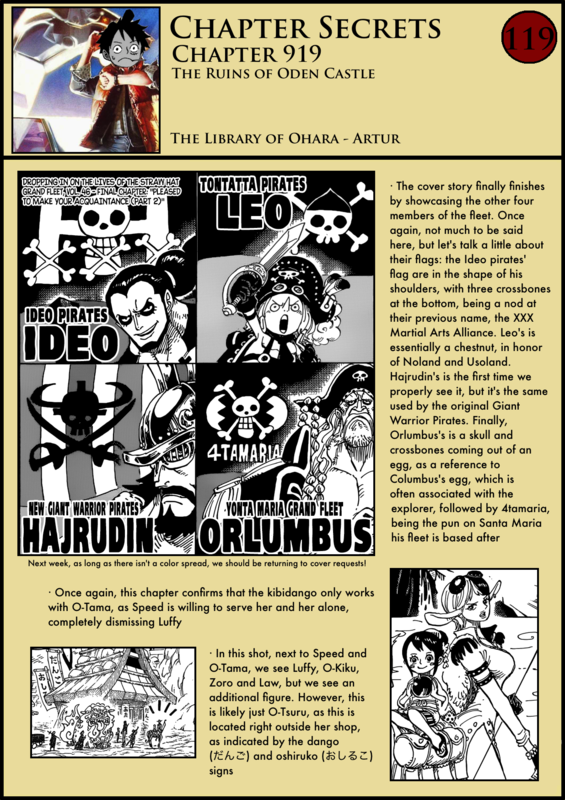 You don’t go to far away from what is shown in the manga, and, generally, Oda doesn’t also. I think he likes to let observant people try to foresee what is going to happen (at least some part of it). Now, about the chapter, I’d like to add the reference to the Edo Bakufu when they talk about isolationism. 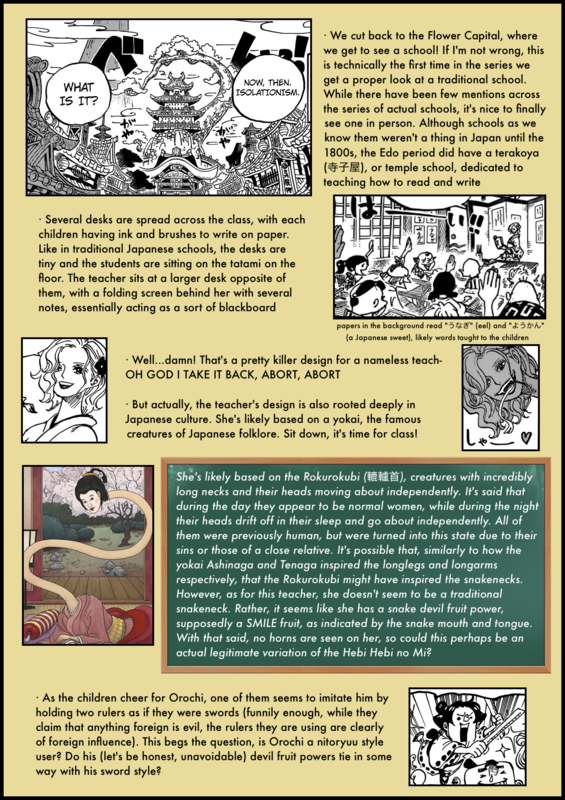 Another inspiration from Oda in history (and/or Rurouni Kenshin). 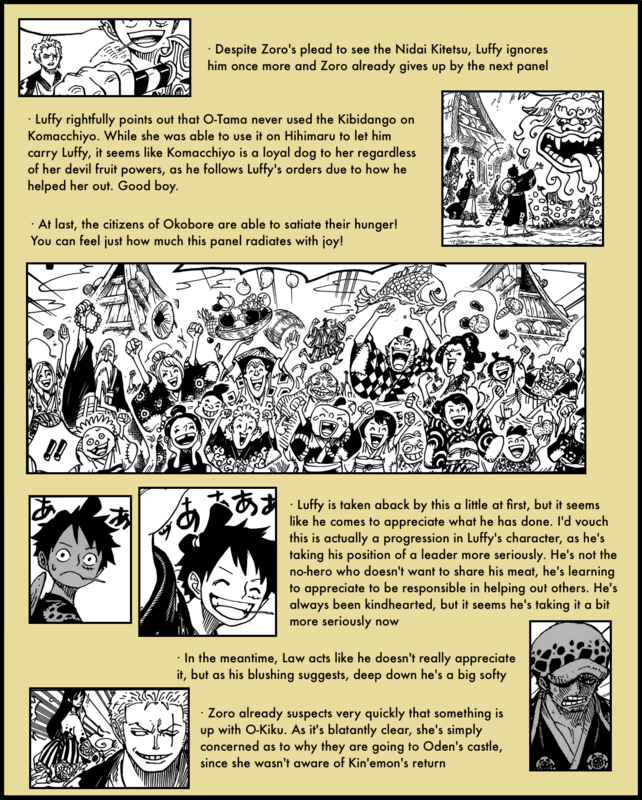 Luffy’s crew will probably open the ports at the end of the saga, starting “Meiji period”. 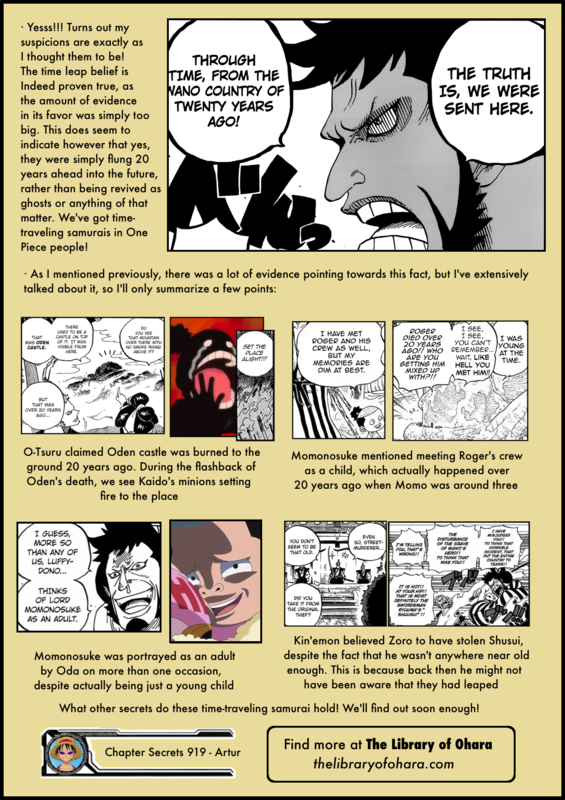 It seems that Kinemon was aware from the start that he was from the past going by his comment of keeping it a secret, so it seems a little weird now that he accused Zoro of being the thief when it’s illogical as you pointed out, the only way I can explain this is that Kinemon simply mistook Zoro as being older than he looked. nice analysis as always. and thanks for adding details and references. about Time-Travel ability, do you think it’s only work one way? like in form of hibernating or some kind of cryogenic sleep? aside of that, do you have analysis as why Oden’s wife sent them exactly 20 years to the future? is this because the maximum of the ability? or she predict in 20 years, Orochi is weaken or even dead? Do we know if Kaidou is aware of the time travel? He sent Jack to Zou to get Raizo, but Raizo should be “dead”, so this leads me to think he must know SOMETHING. Momo and Kinemon was in Punk Hazard, so they know they exist, but Momo was just with the rest of the kids. You’d think if Caesar knew Momo was special he would have had him someplace more secure? Im ur fans from indonesia, great to know u. Thanks.